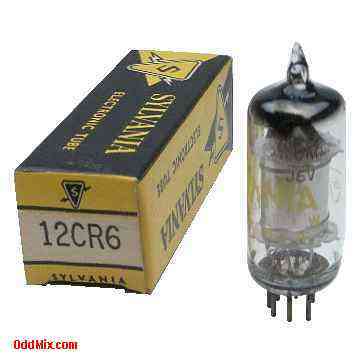 This is a genuine, vintage Sylvania 12CR6 Diode-Remote-Cutoff Pentode electronic tube. This miniature part developed as combined detector and audio amplifier amplifier in automobile and ac-operated radio receivers. The diode side used as an am detector and the pentode unit as an automatic-valume-controlled audio amplifier. Useful for antique radio restoration projects or to set up a private vacuum tube museum. It is new, unused, boxed, excellent condition. First come first serve, as only one of this rare historical, type vacuum tube available!